Skipping the controller check during the checklist doesn't clear the text prompt in the MCDU or the top status bar. The text gets overwritten by subsequent prompts. 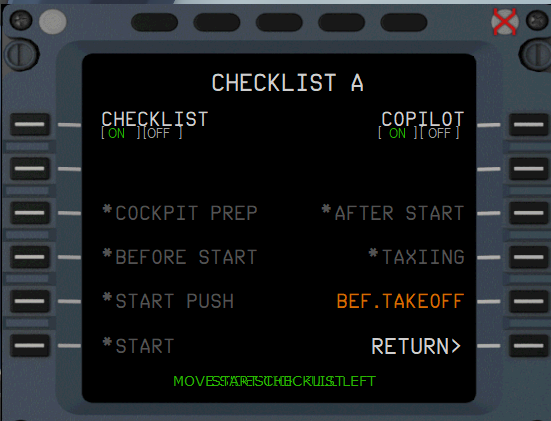 If you choose 'skip item' in the MCDU during this phase the prompt text "move controller full left" remains at the bottom of the MCDU, which then gets overwritten with the next checklist prompts. I can confirm that this same situation occured on my recent flight. Note that I updated to the most recent fix earlier today. MOVE SIDESTICK FULL LEFT stays there flashing even as new items appear and disappear as the flight progresses. That update is now available. After Start check list when flight controls are being asked to check FULL LEFT FULL RIGHT etc no audio response, I ought to skip this item and move to next point of check list.